Landscape professionals offer tips and tricks for getting the most out of design software. To Patrick DuChene, choosing the right landscape design software program is only half the battle. “The software is important, but it’s more about how you use it,” he says. Landscape design software can be a costly investment, so it’s important for contractors to make sure they’re using it to its full capabilities. Here, three landscape design professionals offer advice for getting the most out of your landscape design software program of choice. DuChene, owner of DuChene Design Solutions in Somerville, N.J., began using DynaScape Design & Business Management Software in 2003. He has since become an expert on the product and works with DynaScape to offer in-person and online training courses. He also helps demo the software in the DynaScape booth at green industry trade shows. 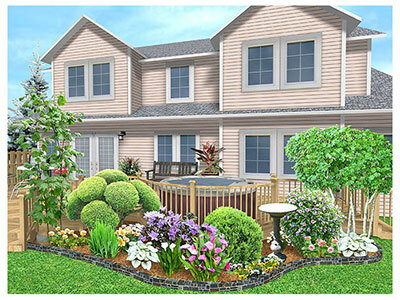 DuChene provides designs and 3D modeling to landscape contractors who serve a primarily residential clientele. DuChene’s first piece of advice is for contractors to decide what exactly they want the software to do and what feature will have the biggest impact on their design process, and then identify programs that specialize in that feature. At the same time, he advises contractors not to buy a program with too many extra bells and whistles they will never use. Too many features will drive up the cost and will make the program more difficult to learn. Because each program’s design elements differ, it’s also important for contractors to make sure the program represents them graphically and the look of the finished design will impress their clients. DuChene says he’s always surprised by the number of contractors who invest in landscape design software but then don’t take the time to master the program. He adds that there are a number of different avenues contractors can take to learn the software, including videos and webinars. Most software providers also will hold onsite training events for users who would benefit from face-to-face instruction. DuChene also advises contractors to look for landscape design software that can execute multiple tasks within the same program. He says one of DynaScape’s biggest selling points is that it integrates landscape design, estimating and job costing into one program. Ken Henriksen, president of Three Brothers Property Service in Farmington, Conn., says his company investigated different landscape design programs by watching YouTube videos and began using Pro Landscape Design Software last year. Before that, the company had done all of its designs by hand. Henriksen says the decision to switch to a software program was driven by the need to have better visuals to present to clients. Since using Pro Landscape, the company’s job closure rate has increased from 30 percent to between 50 and 60 percent. Three Brothers Property Service provides 60 percent maintenance and 40 percent design/build services to an 80 percent commercial, 20 percent residential clientele. “We needed to get into the new program because customers love to see visual things and it’s an easier sell,” Henriksen says. For contractors who are new to landscape design software, Henriksen advises them to “practice, practice, practice.” Designers at Three Brothers Property Service learned the program using photos of their own homes and landscapes before using it on client projects. They also used training videos provided by the vendor. Henriksen also suggests getting a program that helps contractors better communicate with their clients. He especially likes Pro Landscape’s proposal builder feature that includes the names, prices and care instructions for each plant included in the design. The ability to use a photo of the client’s house and to add and take out elements gives customers a clear, detailed image that helps them visualize the final outcome. 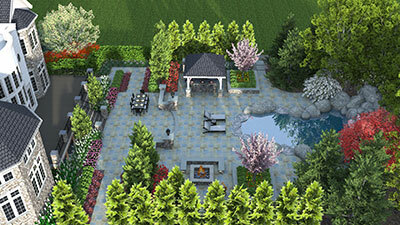 Amber Kurian, co-owner of Green Inspirations Landscaping in Whitemouth, Manitoba, Canada, has used Realtime Landscaping Architect software for the past six years. She says the company primarily uses Mac computers but, after doing some research, she found only two Mac-compatible landscape design programs, both of which had poor reviews. They purchased a PC specifically to use their new landscape design software program. Green Inspirations Landscaping provides 60 percent design/build, 25 percent maintenance and lawn care, 7.5 percent tree removal and 7.5 percent snow removal services. The company offers its design/build services to a 95 percent residential, 5 percent commercial clientele, and its lawn maintenance and care services to a 60 percent residential, 40 percent commercial clientele. “We went with this one because it had good reviews and was as close to a professional product that we could get without using AutoCAD,” says Kurian, who does most of the company’s designs. Kurian recommends contractors take advantage of the program’s annual updates provided by the manufacturer, which, for the Realtime program, cost $100 per year. These updates ensure they’re always working with the most recent version of the program and they don’t miss out on new functions and features. For example, this year the manufacturer provided an update that made it easier to design on properties with grades and slopes, something Kurian says was difficult to do in the past. The upgrade provides more points to allow the designer to make the grade or slope look smoother. Simplicity also was an important feature for Kurian when selecting landscape design software. She didn’t want something that would take hours to figure out how to use, and she also wanted something that would provide quick solutions for their clients.